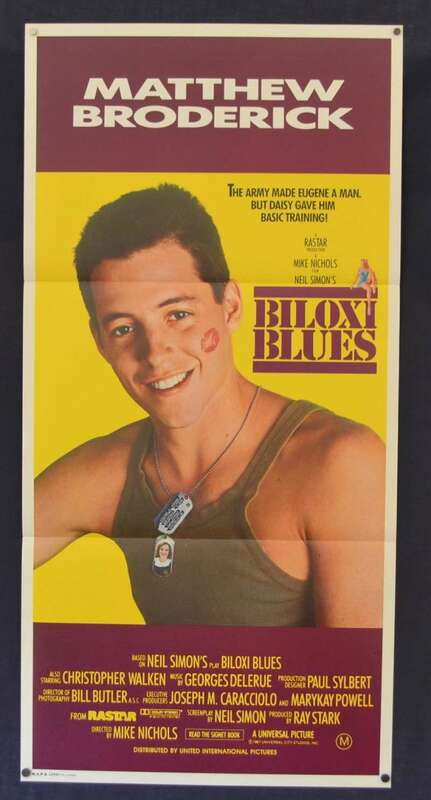 Biloxi Blues is a 1988 American comedy-drama film directed by Mike Nichols, written by Neil Simon, and starring Matthew Broderick and Christopher Walken. Simon adapted his semi-autobiographical 1985 play of the same title, the second chapter in what is known as the Eugene trilogy, the first being Brighton Beach Memoirs and the third being Broadway Bound. The story centers on Eugene Morris Jerome, a 20-year-old Jewish Brooklynite who is drafted into the United States Army during the last year of World War II and is sent to Biloxi, Mississippi, for basic training. 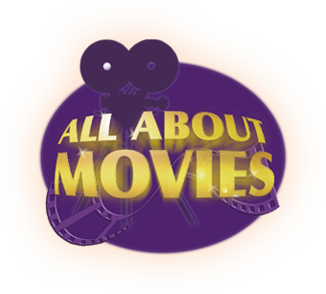 While there he learns to cope with fellow soldiers from all walks of life, falls in love, and loses his virginity in less than ideal circumstances, all while having to cope with an eccentric drill sergeant. 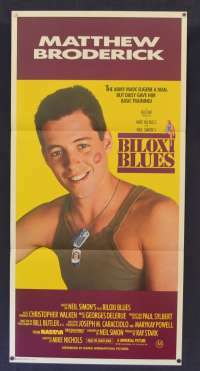 Biloxi Blues received generally positive reviews from critics. The film opened on 1,239 screens in the US and earned $7,093,325 on its opening weekend, ranking #1 at the box office. It had a total worldwide box office of $51,684,798. Folds and Creases: Folded twice as issued to cinemas. Very soft additional horizontal crease above the top credits - hard to see.